Suicide among older adults is a far more common occurrence in the United States than among youth (Centers for Disease Control and Prevention, 2013), and worldwide older people are the group with highest rates of completed suicide (World Health Organization, 2002). Data from the Centers for Disease Control indicate that in 2010, almost 6,000 people over the age of 65 took their own lives in the United States (Centers for Disease Control and Prevention, 2013). 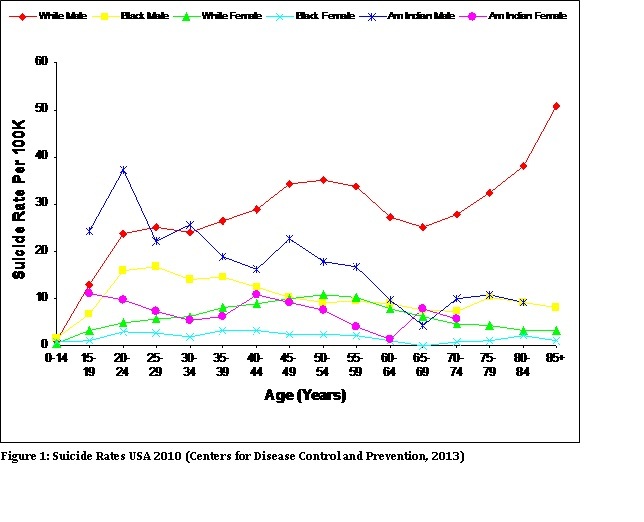 Suicide among older adults in the U.S. is most common among white men aged 85 years or older (Heron et al., 2009; see Figure 1). 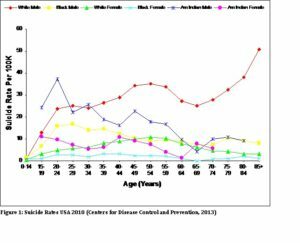 For both black and white women, rates rise through midlife and fall thereafter; black men experience two peaks of risk, one in young adulthood and the second in old age. Most striking is the higher rate at every point in the life course for white men, rising to a peak in the oldest age group of over 45 per 100,000 per year, over 4 times the nation’s overall age adjusted rate of 11.5 per 100,000 per year. Suicide attempts are more often fatal among older adults who tend to use more lethal means (i.e., firearms), are more planful and determined, more frail, and often more isolated and thus less likely to be discovered (Conwell et al., 1990; McIntosh, 1985). While most older adults will die on their first attempt, a previous suicide attempt remains a potent risk factor for suicide death among older adults (Murphy et al., 2012). 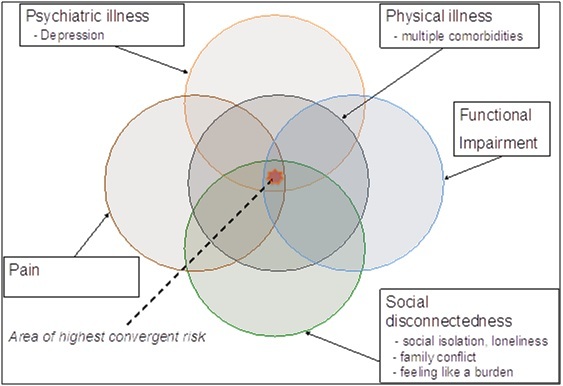 A constellation of risk factors converges to place an older adult at elevated risk (see Figure 2): psychiatric illness (primarily depression), functional impairment, physical illness (particularly multiple comorbidities), social disconnectedness (including social isolation, loneliness, family conflict, and feeling like a burden on others), and pain (Conwell, Duberstein, & Caine, 2002; Van Orden, & Conwell, 2011). The greatest risk occurs when multiple domains of risk converge in a given individual. However, suicide in late-life is not an expected or “normal” response to aging. Rather, psychological research has demonstrated that later life is often characterized by greater well-being, more positive emotions, and better capacity to manage emotions (cf., Socioemotional Selectivity Theory; Charles & Carstensen, 2010). Geropsychologists have much to bring to bear on the problem of late-life suicide, including beginning to shed light on the puzzle of how later life is both a time characterized by the maintenance, and in some cases, strengthening of well-being, and at the same time, is a period of heightened risk for suicide. Before we discuss suicide risk assessment and screening, it is helpful to remind ourselves of the purpose of doing so: the goal of a suicide risk assessment is not a prediction about whether or not an older person will die by suicide. The goal is to determine the most appropriate actions to take to keep the older person safe. It is also important to remember to take action for any and all endorsements of suicide ideation, but not the same action for every level of risk. Finally, it is also important to remember that older adults are less likely to spontaneously report suicide ideation: it is up to us to ask. Suicide risk assessments are safe and do not cause or create suicide ideation. In addition, there are routinized screeners for following up the PHQ-9, including the P4 Suicide Risk Screener (Dube et al., 2010). If a respondent reports active suicide ideation, the P4 can be administered. The 4 “p’s” in the P4 are: past suicide attempt, suicide plan, probability (perceived risk), and (lack of) preventive factors. The P4 has an algorithm for categorizing risk as minimal (or low), higher (or moderate), and higher (or high) risk. Missing from the P4 are corresponding clinical actions to take for each level of risk. Suggestions for appropriate actions to take for each level of risk are below, with the caveat that there are no empirically supported risk assessment procedures with corresponding actions to take; good clinical judgment must be exercised and any agency procedures followed as well. For those categorized as low or moderate risk, the following is recommended: 1) expressing concern about suicide ideation, 2) obtaining consent to contact the primary care physician, 3) urge they remove means, 3) create a safety plan (see a template from Barbara Stanley and Greg Brown); 4) provide emergency numbers including 1-800-273-TALK; 4) consult a colleague or supervisor. For those at high risk, emergency services must be considered right away (ED, mobile crisis, 9-1-1)—do not leave the patient alone until appropriate actions are taken. Several interventions have been shown (in quasi-experimental studies) to be associated with reductions in suicide rates among older adults, and all were multi-component, multi-level interventions that involved: 1) telephone-based outreach, evaluation and support services (DeLeo and colleagues’ Telehelp/Telecheck intervention; De Leo et al., 1995; De Leo et al., 2002); 2) screening and referral for care, and engagement in health education, volunteer, and peer support activities (Oyama and colleagues, 2006; 2008); and, 3) case management, supportive phone calls, psychoeducation, and psychiatric care (Chan et al., 2011). Collaborative care models (CCM) that include Interpersonal Psychotherapy (the PROSPECT study; Alexopoulos et al., 2009) and Problem Solving Therapy (the IMPACT study; Unutzer et al., 2002) are associated with reductions in suicidal ideation for some depressed older adults. Treating depression to remission, as well as addressing other risk factors such as functional impairment, pain, and social disconnectedness, are key components of suicide prevention in later life (Conwell et al., 2011). Other key components include removing access to lethal means, particularly firearms (Conwell et al., 2011), and coordination of care with primary care physicians, given that many older adults who die by suicide are seen by their PCP’s in the months and weeks leading up to their deaths (Luoma et al., 2002). Finally, older adults may be less likely to disclose depression and suicidal ideation, perhaps in part due to cohort differences as well as personality traits present in some older adults, including low openness to experience (Duberstein, 1995). Thus, directly and routinely inquiring about suicide risk is imperative, especially for older adults who present with depression. Just as a physician regularly checks blood pressure, geropsychologists working with depressed older adults must regularly assess suicide risk. Coordinating safety plans with family members or other key people in the older person’s life is also recommended, especially given that cognitive impairment may accompany depression in later life. Fremouw, W., McCoy, K., Tyner, E., & Musick, R. (2009). Suicide Older Adult Protocol – SOAP. Unpublished manuscript, West Virginia University. ACCESS MANUAL HERE. Oyama. H., Fujita, M., Goto, M., Shibuya, H., & Sakashita, T. (2006). Outcomes of community-based screening for depression and suicide prevention among Japanese elders. Gerontologist, 46(6), 821-26. Alexopoulos, G. S., Reynolds, C. F., 3rd, Bruce, M. L., Katz, I. R., Raue, P. J., Mulsant, B. H., . . . Group, P. (2009). Reducing suicidal ideation and depression in older primary care patients: 24-month outcomes of the PROSPECT study. American Journal of Psychiatry, 166(8), 882-890. Chan, S.S., Leung, V.P., Tsoh, J., Li, S.W., Yu, C.S., Yu, G.K., et al. (2011). Outcomes of a two-tiered multifaceted elderly suicide prevention program in a Hong Kong Chinese community. American Journal of Geriatric Psychiatry, 19(2):185-96. De Leo, D., Carollo, G., Dello Buono, M. (1995). Lower suicide rates associated with a Tele-Help/Tele-Check service for the elderly at home. American Journal of Psychiatry, 152(4), 632-4. De Leo, D., Dello Buono, M., & Dwyer, J. (2002). Suicide among the elderly: the long-term impact of a telephone support and assessment intervention in northern Italy. British Journal of Psychiatry, 181, 226-9. Oyama, H., Sakashita, T., Ono, Y., Goto, M., Fujita, M., & Koida J. (2008). Effect of community-based intervention using depression screening on elderly suicide risk: A meta-analysis of the evidence from Japan. Community Mental Health Journal, 44(5), 311-20. Unutzer, J., Katon, W., Callahan, C. M., Williams, J. W., Jr., Hunkeler, E., Harpole, L., . . . Treatment, I. I. I. M.-P. A. t. C. (2002). Collaborative care management of late-life depression in the primary care setting: A randomized controlled trial. JAMA, 288(22), 2836-2845.